Today is my day off and I decided to celebrate with a little day drinking. 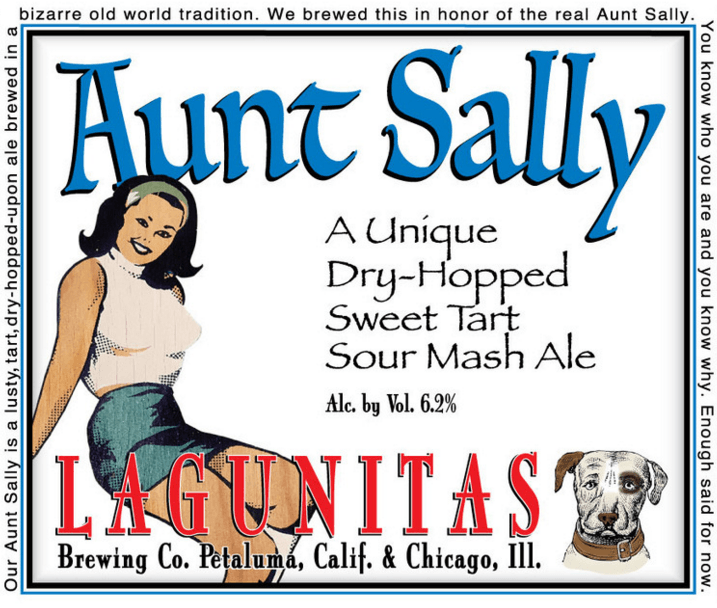 I went to the corner store and surveyed their beer selection for a few minutes before deciding on a six pack of Aunt Sally from Petaluma, California’s Lagunitas Brewing Company. It’s described on the label as A Unique Dry-Hopped Sweet Tart Sour Mash Ale, and that’s precisely what it is. It’s a good introduction to the world of sour beers. It pours a pale goldish amber color with a moderately foamy head. The aroma is of citrus fruits, green apple, and floral hops. It tastes sweet at first but turns tart and sour on the tongue. I get bursts of lemons, limes, maybe some pineapple, and hops. It’s crisp and seductive, the type of beer that cider lovers and wine aficionados can enjoy. Aunt Sally is a great beer for day drinking. It has an alcohol percentage of 5.7. It’s stronger than a Budweiser but lighter than most IPAs. It’s very drinkable and reminds me of sipping lemonade on the front porch at grandma’s house in the country. And my grandma didn’t have a porch or live in the country. Drink this beer if you’re lucky enough to get it.